South Korea’s exports showed improvement in the first 10 days in April due to feeble recovery in Chinese demand and longer work days, raising hopes for a snap in the losing streak for the last four months. 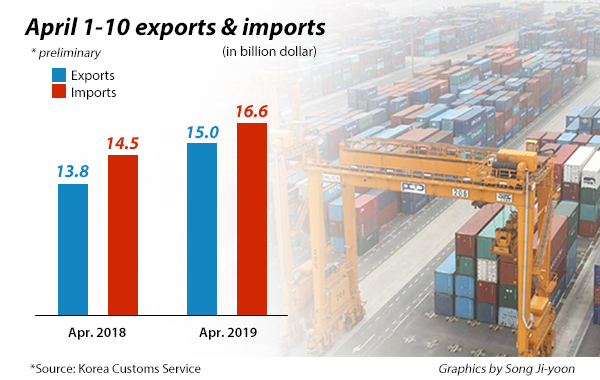 According to data released by the Korea Customs Service on Thursday, the nation’s exports reached $15 billion in the first 10 days in April, up 8.9 percent from a year-ago period. The increase mainly owed to longer working days, 8.5 days this year versus 7.5 days last year. The outbound shipments extended its losing streak for four months in a row from last December to March, but the government said the downward pace has slowed recently on a slight recovery in semiconductor and vessel shipments. Although the export gains in the first 10 days of this month was mainly owed to the longer working days, it is positive that exports are showing signs of bottoming out, the government added. From April 1 to 10, shipments of petroleum products rose 22.8 percent, ships 72.8 percent, automobiles 20.1 percent and wireless communications devices 64.3 percent. On the other hand, semiconductor exports shrank 19.7 percent and display devices contracted 39.1 percent. By country, exports to China grew 0.8 percent, the U.S. 19.9 percent, European Union 20.2 percent and Vietnam 19.4 percent. Exports to Hong Kong, however, declined 35.1 percent and Singapore 13.3 percent. The nation’s imports in the first 10 days gained 14.9 percent on year to $16.7 billion. Trade deficit came at $1.6 billion.